Nadia was raised in a strict Muslim home in Pakistan. She remembers even as an eleven-year old being curious about the Christian church in her neighborhood. She knew better than to ask her parent’s anything about it. They had already firmly warned her to ignore those infidels and their church, because Christians were an affront to their Muslim faith. But her parents’ opposition only served to arouse her curiosity even more. One time when Nadia was walking by the church she heard the pastor over the church loudspeaker saying that Jesus was ‘the Way and the Truth and the Life.’ She wondered what that meant. Nadia wondered what Jesus expected of her if she wanted to be a part of his kingdom— what she had to do and what rules and rituals she was required to perform. Rachel told her that Jesus first of all wants her to know of his love for her, and then to have her heart and her trust. Then, she would want to obey. Rachel gave her a Bible, which Nadia kept hidden and read only when no one else was home. She learned that God was a God of grace and love and compassion. This God would leave the 99 other sheep to save just one— perhaps even her. This God was quite unlike the God she was raised to believe in, and she wanted to be a part of his kingdom. She prayed and placed her trust in Jesus, and would occasionally sneak off to attend the church. Time went by. One day, Nadia’s brother discovered her going to church. Her flew into a rage, grabbed her by the hair, dragged her home, and beat her severely. He insisted that she deny Christ, but she refused. He picked up a wooden bowl and slammed it into her face, splitting the skin above her eye. As blood poured out, her shoved her into her bedroom and locked the door. He kept her there for weeks, entering only to give her small amounts of food and water, along with more beatings. Not one of her other family members objected to his brutality, or did anything to help her. Finally, Nadia escaped and found refuge with the pastor and his family. Being a former Muslim in a town where she was known put her and the pastor and the whole congregation at risk. So the Christians helped her to move to a distant city where people would not know she was a convert. There she was baptized, and met and married a Christian man. When Nadia’s parents found out where she was and learned of her marriage to a Christian, they registered kidnapping complaints against the man. They claimed he had lured her away from her Muslim faith. Her brother attacked beat her husband. Knowing that the authorities would rule against them, they had to go into hiding. Again, a Christian congregation helped them move, find a home, get settled, and find work. They remain strong and faithful and thankful to God, despite the ongoing danger that Nadia’s family will again find them. In Luke 12 Jesus describes how families will be divided because of him. Two chapters later Jesus talks about counting the cost to follow him, and being willing to give up everything to follow him, and about bearing your cross for him. Did you count the cost before you became a Christian? I didn’t. I couldn’t even count at all when I became a Christian, being baptized at two weeks old. Yes, I grew up in the faith and made it my own. But I still have not had to give up everything to follow Jesus, and my cross has not been too heavy compared to the crosses that many people have to bear for their faith. They indeed have to count the cost before believing in Jesus. Nadia knew what she was in for when she started going to that Christian church. She knew the hostility from her family and from the whole town. And she did have to give up everything to bear her heavy cross. James 1:12 says, “Blessed is the one who perseveres under trial because, having stood the test, that person will receive the crown of life that the Lord has promised to those who love him.” We are all tested, though in different ways. Christians in many Muslim areas are being tested by persecution, danger, constant threats, and even death. They are being tested by the loss of everything. In this country, we are more likely to be tested by the spiritual danger of having everything. We are safe, we are secure, we have good health care, we are not being forced to leave our homes, we do not have to worry about our children being kidnapped and sold into slavery, we don’t have to worry about meeting secretly to worship, and even the poorest of us is wealthy by the standards of much of the world. But having all of that brings other temptations and a different kind of testing. Our persecuted sisters and brothers are forced to depend on God. They have no other hope. We might find it easy to believe we are able to manage life on our own, looking to God only when we think we need him. They risk their lives to worship. Here, many people worship if they feel like it and if it fits into their schedule. You will hear from pastors in Iraq and Syria and refugee camps how their worship services are growing. Most churches in the ‘more fortunate’ nations are in decline. We are all tempted, though by different situations. We must all pray for the faith to meet our various tests. Referring to those suffering for their faith Hebrews 11:34 says, “Their weakness was turned into strength.” Perhaps our test is to make sure our strength does not turn into weakness. 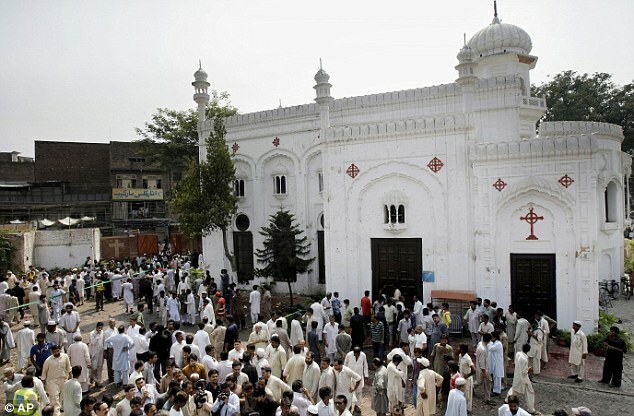 All Saints Christian Church in Peshawa, Pakistan; the site of a 2013 suicide bombing which killed 85 and wounded 140. Heavenly Father, I thank you that you have counted me worthy to suffer for the sake of my Lord Jesus Christ, and I give you thanks that I may partake in the promise of eternal life. Amen.